Sega Mega Drive Classics, or Genesis if you’re heavy on your freedom and eagles, is but the latest in a long standing tradition of releasing Mega Drive collections on modern consoles. In theory, this is very much something I am in favour of. The Mega Drive is dear to me, as it is to many gamers who grew up with one, but it never quite got the care it deserved when it came to bringing them to modern audiences, and unfortunately this edition does little to change that. The main problem these collections suffer with is a sheer lack of imagination when it comes to the games on offer. 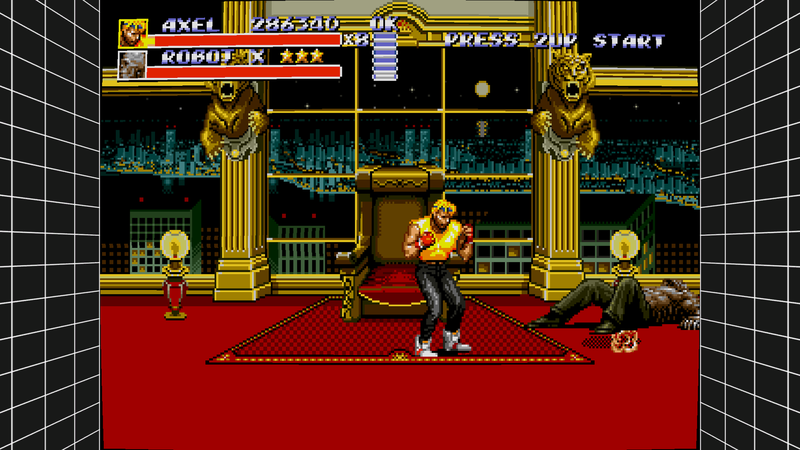 The Mega Drive’s big hitters are present; the Sonic , Streets of Rage and Golden Axe games that everyone knows, for instance. Well, mostly. We’re missing Sonic and Knuckles and Sonic 3. But these games always appear in the collections and while seeing them again ought to be expected it doesn’t really offer anything we haven’t seen before, while many of the system’s more obscure gems are nowhere to be seen, in a tragically missed opportunity to bring them to modern audiences. There are even fairly well known games that are bafflingly missed out. Even accounting for potential (but unlikely) licensing issues that would potentially affect games like Aladdin, there are those like the Strike series that have no modern footprint that would have made an excellent addition. Here are the games featured on the disc, as proudly advertised on the box. And here are they are with the games that were also in the PS3 Mega Drive Ultimate Collection removed. There are notable omissions in comparison too, such as Ecco the Dolphin. Unfortunately a comparison to the Ultimate Collection really highlights the things it really could have done better. While it certainly wasn’t perfect, the UC really tried to appeal to retro game fans with extras, showcasing box art (albeit with some missing), providing a history of the game, and giving us interviews with creators or even alternate versions of games, like the arcade port of Altered Beast. Unfortunately Classics does none of that, which was extremely disappointing. It does offer various graphical filters, as well as the option to fast forward or rewind a game while playing, plus online play, but that’s really nothing more than good emulators already offer. Additionally, the online play doesn’t appear to function properly, with inadequate matchmaking and player 1 being able to use the time skip functions without player 2 actually seeing it, causing the game to seem like it is acting very randomly. One of the filters in action. There is also something of an issue with the control scheme. For some utterly baffling reason you cannot remap the controls as you like. There are just two schemes to select from, neither of which I even vaguely liked. There’s really no excuse for that. At one point all of my save data was also randomly erased itself, which would have meant that I’d have to redo all of the challenges if I hadn’t stubbornly finished them right away. Really the only worthwhile addition comes in the form of challenges, which are a little interesting. Unfortunately they do not feel particularly well thought out, with some very inconsistent difficulty and some being just plain boring. The same is true of the trophies; despite some nice pop culture references in the trophy names some of them are just insultingly uninspired. 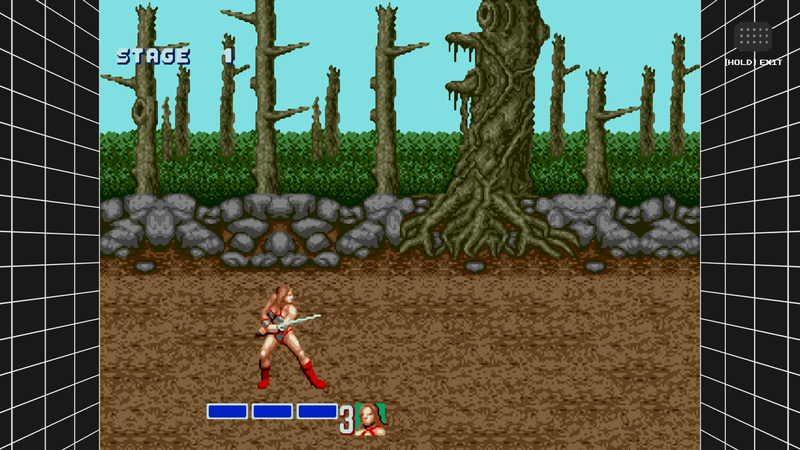 For instance, to get Golden Axe’s, you literally have to start the game and then press one button. Some games also have both challenges and trophies, while others have neither. The presentation, at least, is rather nice. You select the games from picking their boxes off the shelf and physically insert the cartridge into the console (although oddly they pull it out again if you choose to reset), and the main menu is set up like a kid’s bedroom in the 90s, with some distinctly unsubtle affectionate parodies. Some customisation options would have been great, certainly, but it’s a nice touch, and brings it some character that the UC lacked. Overall, however, it is hard to see the collection as anything other than a massive missed opportunity. There is so much that could be done, and there are so many amazing Mega Drive games out there that never see the light of the day, that the lazy recycling of games is wholly unsatisfying, and certainly nowhere near worth the £25 price tag. Still nice to hit the classics of course. Nice review, a shame the collection is missing so many essential classics from back in the day. Might get it when it hits the bargain bin.